Sign up for free and just shop with Dell Outlet as normal. Our members earned $10,000+ at Dell Outlet in the past month. Refurbished Canvas 27 KV2718D Was: $1349 Now: $1106.18 and Free Shipping. Refurbished Canvas 27 KV2718D Was: $1349 Now: $1106.18 and Free Shipping. Extra 14% off Monitors and Docks. Extra 14% off Monitors and Docks. 15% off any 11" Latitude 3190 or 13" Latitude 3390 2-in-1. 15% off any 11 Latitude 3190 or 13 Latitude 3390 2-in-1. 14% off any 15" Precision Mobile 3520. 14% off any 15 Precision Mobile 3520. 15% off any Latitude Rugged Laptops. 15% off any Latitude Rugged Laptops. Additional 14% off select PowerEdge Severs. Additional 14% off select PowerEdge Severs. 12% off any Laptop, 2-in-1, Desktop, or Server. 12% off any Laptop, 2-in-1, Desktop, or Server. 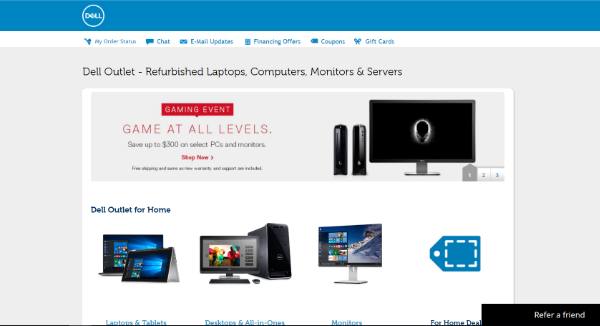 Only purchases made on Dell Outlet's US site are eligible for cash back. Shop online for all your favorite electronics, including PCs, gaming systems, camcorders and more. Check out leading brands like Inspiron, XPS, OptiPlex, Alienware, PowerEdge, Latitude and Intel. Revamp your home or business with sleek desktops, laptops, monitors and servers. Snag innovative, low-cost Dell Outlet products by choosing the “certified refurbished” or “scratch & dent” options. Save even more money with our Dell Outlet coupons and cash back deals. Want reliable delivery for less? Get 3 – 5 day shipping on all Dell Outlet systems, monitors and printers for free. Get the ultimate gaming experience with the Inspiron 15” 7000 (7567). This baby has a 74 WHr battery and a state-of-the-art advanced thermal cooling design. So you can play for hours and keep cool when the action heats up. Even better, the vivid NVIDIA® GeForce® graphics allow you to optimize your settings with its own video memory. Are you a night owl? No problem. Sneak a midnight gaming sesh in the dark with the backlit keyboard. It doesn’t just help you see; it also helps you move. The WASD keys allow you to maneuver both hands swiftly and efficiently. Immerse yourself in the world of your game with the Alienware Graphics Amplifier. This nifty number will transform your Alienware 13, 15 and 17 R2 & R3 notebooks and X51 R3 desktop with enhanced gaming performance. Boost visuals with support for a desktop graphics card. You can find this device under Gaming Accessories. Equipped with an Intel Core 7th Generation i7-7500U processor, the Inspiron 17” 7000 (7779) 2-in-1 is the perfect laptop for the gal/guy-on-the-go. Adapt to any environment with 4 positioning modes. Standing for Netflix nights, laptop at the office, tablet in the café and tent mode for shallow surfaces. This Inspiron PC will be your new personal sidekick! Get it certified refurbished, and slash the price down. The Inspiron 15 – 5559 is one of Dell and Windows’ technological love children. All the best features from each brand blend perfectly in this performance-boosting laptop. Windows 10 allows you to carry over pinned applications so you can familiarize your experience. AMD discrete graphics help you manage powerful photo or video editing without impacting functionality. The Latitude 3450 is another brilliant Dell and Windows combo. Windows 10’s battery-saver automatically conserves power. So you can work harder and play longer. All new Latitude 14 3000 Series laptops are leaner and lighter than ever before. They also have the current Intel® Core™ processors and Windows 7 Professional or Windows 8.1. That means you can work anywhere, and you’ll have copious connectivity options. Moving on to desktops, the XPS 8920 is 27% smaller than previous XPS desktops but twice as powerful. The Intel® i5 or Intel® i7 Quad Core™ processor and high-performance graphics drive power and speed for gaming, video playback and video editing. The Intel® Optane™ memory makes the XPS 8920 the ultimate smarty-pants. It stores your frequently used commands so you can navigate the PC faster and more efficiently. Looking for a strong and silent type? This desktop can take on rigorous work without making a peep. The thermally controlled fans enable this system to meet Dell’s audile limits so you can work in peace. You can find this device under Dell Outlet Home and Home Office. The OptiPlex 3000 (3046) desktop is no slouch when it comes to display support and memory. DisplayPort, HDMI and optional VGA connectivity offer expansive visibility for your projects. Up to 16GB of DDR4 memory technology allows you to seamlessly manage your PC. Increase your workload with the PowerEdge R730XD processor. It’s optional in-server hybrid storage configuration can strengthen tiering for up to 28 drives in a 2S/2U system. Retrieve data fast with new flash-capable configurations. This includes ultra-high-performance NVMe Express Flash PCIe drives and 1.8" SATA SSDs, 12Gb SAS SSDs. Want to automate your process? You can adjust Dell Outlet servers to firmware baselines on an internal network. Even cooler, Tech Support reports monitor 5,000+ system parameters and optimize the time between identifying and resolving server issues. So you can spend more time focusing on your work instead of troubleshooting tech issues. 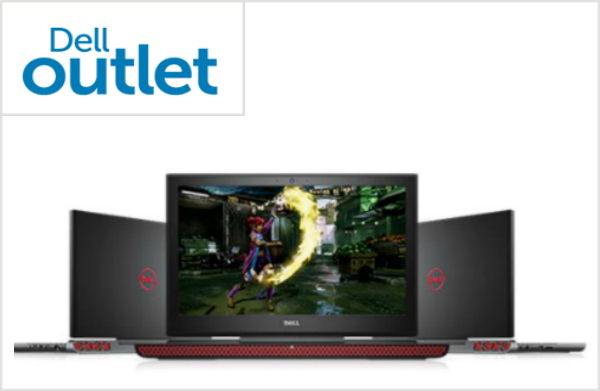 Most Dell Outlet coupons are applied to your purchase when you go to My Cart. However, you may need to punch in a coupon code if your discount does not show up at checkout. If your voucher is not applied to your total cost, enter your Dell Outlet coupon code under Coupon Entry at My Cart. Then select Apply Coupon. Feel free to apply new codes each time you press Apply Coupon. Please keep in mind, Dell Outlet coupons and offers are valid on new purchases only. They’re also available for end-users only. So they cannot be used for online auctions and reselling. Dell Outlet devices are already assembled and set up so they’re usually scheduled to ship within 24 hours of payment verification. There may be delays, however, due to factory or payment issues. Once your order is complete, you will be given an estimated shipment date. Don’t forget to add the appropriate number of business days to your shipping option for an approximate calculation. You can then track your order online through the order status tool. Don’t mind waiting for your package? Take advantage of free 3 – 5 day Ground Delivery shipping on printers, systems and monitors. This service is available in the Continental U.S. only. Please keep in mind that the shipping address must be the actual location of the end-user. Dell Outlet will not send any products to PO Boxes, hotels, warehouses, freight forwarders, distribution centers or airports.